Melly Oey was born and raised in Indonesia where she taught music for over 20 years. She was a Yamaha Music teacher under the Yamaha Music Foundation, Japan where she taught Organ (Electone) for ten years. Her students ranged from kids to seniors, and they participated in International Annual Festival, Concerts, and competitions. 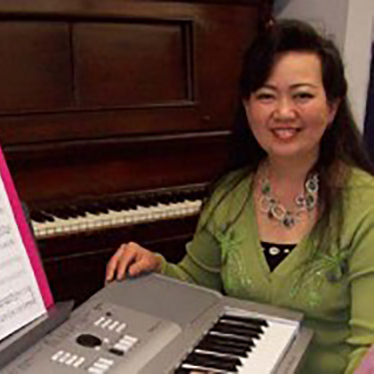 She taught piano and keyboard private lessons and in elementary schools as well. She learned music at Yamaha Music School, Indonesia where she earned: Advancement Examination Fundamental Certificate, Advancement Electone Performance Certificate, and Teachers Training Course Certificate. She took piano lessons, and learned theory of music with Royal Music School, and earned Certificate of Theory Music Grade 5. Arriving in Vernon over ten years ago, she found that there was a need to “fill the gap” for Keyboard Lessons, and this year will be the sixth year teaching at the VCAC. Melly Oey believes that with just a few lessons, anyone can experience the joy of playing music. Playing electric keyboard is really fun, especially for people who don’t want to play a musical instrument that is difficult to learn and will take a long time to learn.